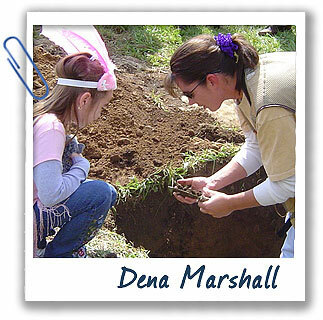 For Dena Marshall getting dirty is one of the best parts about investigating soils. When did you know you wanted to be a soil scientist? My mom told me I was destined to be a soil scientist judging by the amount of mud pies I ate! Now you spend a lot of time mapping soils. What’s that involve? We investigate soils down to 60-80 inches. We look at different textures, colors, what it feels like, what it’s made of, and the slope of the landscape. You have to be curious to be a soil scientist. Just when you think you have it all figured out, you dig another hole and see something unexpected that raises new questions to answer! My motto is: “It’s been a good day when you got dirty!” I don’t walk around the puddles. I walk right through them. I must have been a pig in a former life. The sloppier it is, the happier I am!